The 5th Telematics Conference Middle East & Africa, which was held on 28 March 2019 in Jumeirah Emirates Towers hotel in Dubai, ended successfully. More than 150 participants from more than 28 countries participated at this telematics for fleet management focused conference and exhibition. Telematics Conference team would like to say thank you to all participants. Special thanks goes to our sponsors, speakers, exhibitors and media partners. On 28 March, ‪ Ivor Wheeldon, Head Customer Operations, Enterprise IoT at HERE Technologies will be art of the conference agenda at 5th Telematics Conference Middle East & Africa in Dubai. Ivor will run the interactive session Fleet Telematics, Advanced location technology for complex industry use cases. In this session audience will explore the power of location technology in fleet telematics, look at the value this brings to the industry through a range of use cases and examples. Delegates will review key new location technology and industry trends and look ahead at what role location technology may play in the future. Session participants will discuss what barriers there are to adoption, what challenges there are in the industry from environmental, legal and safety through to availability of data and technology. Ivor will also be part of the panel discussion on the Great Impact of New Technologies in the field. Read more about conference agenda on event’s webpage. Inbound is a Bronze Sponsor and exhibitor of the 5h edition of Telematics Conference Middle East & Africa, which will be held on 28 March 2019 in Dubai. Inbound is a Connected Vehicles Intelligent Mobility Startup from Dubai severing the region most mission critical to solve their daily mobility challenges through IOT, Machine Learning & Deep Programming. Intuitio AI is based on Open Source Research Platform. It provides you with the freedom of running the apps and programs you care about most in your car. Meet Inbound team at the booth No. 13 and get more information about their products. Transics a WABCO company will exhibit at the 5th edition of Telematics Conference Middle East & Africa which will be held on 28 March 2019 in Dubai. Transics International BVBA, a WABCO company, was established in 1991 and develops and commercialises fleet management solutions for the transport and logistics sector. Transics is a global full solution provider of truck, driver, trailer, cargo and subcontractor management. It’s solutions are the result of many years of experience, thorough R&D efforts and an intensive focus on the customer experience. Transics, headquartered in Ypres (Belgium), has become a European leader in its sector and is active worldwide. Meet Transics a WABCO company team at the booth No. 5 and get more information about their products. Geotab Africa will exhibit at the 5th edition of Telematics Conference Middle East & Africa which will be held on 28 March 2019 in Dubai. Geotab Africa is one of the leading telematics companies in the world, offering GPS fleet tracking and fleet management solutions. Geotab currently has over 1,300,000 GPS tracking devices in operation globally. The Geotab GO7 plug-and-play device together with the open-platform MyGeotab software provides customers with end-to-end fleet management solutions, enabling them to monitor driver productivity, ensure safety and compliance, and optimize fleet operations. The Geotab Software Development Kit (SDK), APIs, and IOX expandability enables Geotab Africa to create bespoke solutions and third-party integrations for clients across industries such as Mining, Security, Public Transport, Concrete and Construction. Meet Geotab Africa team at the booth No.12 and get more information about their products. VST Mobility Solutions will exhibit at the 5th edition of Telematics Conference Middle East & Africa which will be held on 28 March 2019 in Dubai. VST has developed mobile and web based applications with associated hardware devices for different needs of smart transportation. Web Solutions developed by VST ensures safe and cashless journey for the passengers, with effective management and monitoring facilities for the administrators. Mobile Applications developed by VST enables passengers to avail different modes of connected transport solutions like taxi, train, bus, boat using single travel card. VST provides real time vehicle tracking software with geo fencing, fuel monitoring, driver behaviour, etc. Meet VST Mobility Solutions team at the booth No. 7 and get more information about their products. Cradlepoint will exhibit at the 5th edition of Telematics Conference Middle East & Africa which will be held on 28 March 2019 in Dubai. Cradlepoint, the leader in cloud-delivered 4G LTE network solutions for business, service providers, and government organizations, committed to extend its leadership into the emerging 5G space. More than 23,000 customers worldwide in retail, financial services, healthcare, transportation, public sector, and other industries rely on Cradlepoint to keep their branch and mobile networks, and IoT devices, always connected and protected. Our Elastic Edge™ vision provides a blueprint for next-generation, software-defined edge networks built on pervasive and reliable 4G/5G wireless services, connecting people, places, and things everywhere with enterprise-class visibility, security, and control. Cradlepoint’s all-inclusive NetCloud Solution Packages for branch, mobile, and IoT networks combine tailored NetCloud services with fit-for-purpose hardware and a comprehensive support plan. Meet Cradlepoint team at the booth No. 2 and get more information about their products. Queclink will exhibit at the 5th edition of Telematics Conference Middle East & Africa which will be held on 28 March 2019 in Dubai. Founded in 2009, listed on the Shenzhen Exchange in 2017 and headquartered in Shanghai, Queclink is a world major telematics hardware provider offering wireless M2M devices for fleet management, stolen vehicle recovery (SVR), insurance telematics (UBI), lone worker safety and remote monitoring of assets, etc. as well as ODM services globally. To date, Queclink has sales and distribution partners in over 140 countries worldwide with more than 7 million wireless GNSS trackers running worldwide. With over 350 employees, the Company owns proficient teams to provide multi-language sales and 24h x 7 technical support for global customers. Meet Queclink team at the booth No.10 and get more information about their products. Sygic will exhibit at the 5th edition of Telematics Conference Middle East & Africa which will be held on 28 March 2019 in Dubai. Sygic Enterprise is a specialized division of Sygic Company, the developer of the most advanced navigation app, trusted by 200+ million drivers worldwide. Sygic focuses on developing enterprise ready Maps & GPS Navigation with SDKs for integration into fleet management, tracking, route planning and optimization solutions. Sygic Professional Navigation with SDK, Sygic Maps API Services and other location based services are trusted by more than 2000 fleets and 1,000,000 professional drivers in fields of transportation, logistics, parcel delivery, field work, automotive, utilities, emergency and communal services. Meet Sygic team at the booth No. 3 and get more information about their products. Citracks is a proud Co-Sponsor of the 5h edition of Telematics Conference Middle East & Africa, which will be held on 28 March 2019 in Dubai. 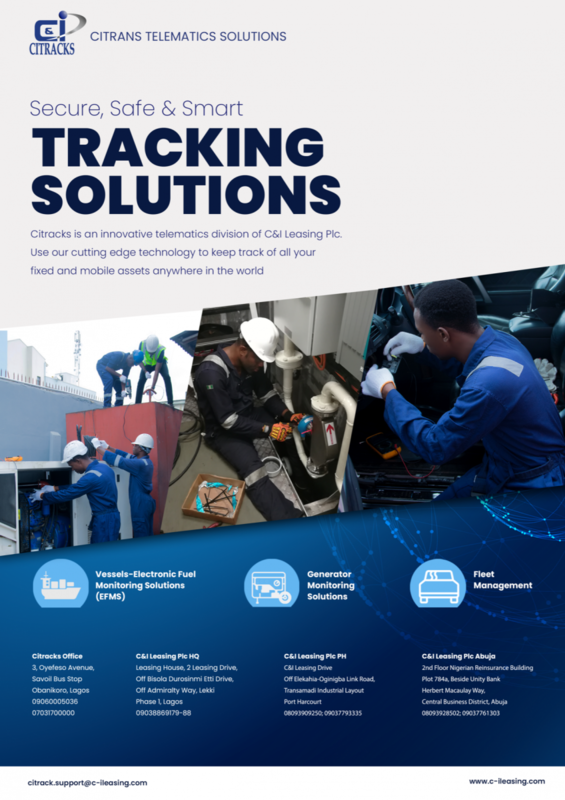 Citracks is a leading telematics solution provider and subsidiary of the C & I Leasing Group - a diversified, operating lease and business service conglomerate providing support services to various indigenous and multinational organizations in West Africa along three major lines: Fleet Management, Personnel Outsourcing and Marine Services. C & I Leasing has also been the sole owner and manager of the HERTZ Car Rental franchise in Nigeria. For over 20 years, CITRACKS has been supporting the C & I Fleet Management business and the Hertz car rental franchise which both have a cumulative and growing asset register of at least 1,000 vehicles and chauffeurs. Using our diverse collection of superior technology, our clients have access to cutting-edge solutions for Fleet Monitoring, Vehicle tracking, Speed limiter, Reverse Camera alarm system, Vehicle Video Surveillance, Generator intelligence Monitoring, Electronic Fuel Monitoring System (EFMS) installation, Vessel Tracking among several other solutions available. Some Citracks reputable clients include: British American Tobacco, Hertz, Creseada International, PZ, Fynmark Marine, Temile Development company among others. Contact us for more information and register now. Register now to get an early bird discount for 5th annual Telematics Conference Middle East & Africa, which will be held on 28 March 2019 in Dubai, United Arab Emirates. Early bird registrations are available till 31 January 2019 only. Ensure your place now. There are only a few days left to get a special early bird discount for the 5th edition of Telematics Conference Middle East & Africa. Register now and get your ticket for EUR 150/USD 170 (+10% DTCM ticket fee) only. Prices are available only till 15 December 2018. The 5th edition of Telematics Conference Middle East & Africa will be held in Jumeirah Emirates Towers in Dubai. For basic information regarding the hotel click here. Register now for the 5th edition of Telematics Conference Middle East & Africa and get your ticket for EUR 150/USD 170 (+10% DTCM ticket fee) only. Prices are available only till 15 December 2018. Registrations are now open! Register for the main commercial vehicle telematics focused conference and exhibition in the Middle East & Africa region and ensure your place for EUR 150/USD 170 (+10% DTCM ticket fee) only. The offer is available till 15 December 2018. Register here. For further question please contact us. Telematics Conference team would like to thank to all participants of the 4th Telematics Conference Middle East & Africa. We hope you enjoyed the event, met some business partners and established fruitful cooperations. Lunch sponsor Trakker Middle East. THANK YOU ALL. SEE YOU NEXT MARCH IN DUBAI. We are pleased to announce our 2018 exhibitors and sponsors. Contact us for exhibition or sponsorship opportunites. Register now for the 4th Telematics Conference Middle East & Africa and network with 150+ delegates from commercial vehicle telematics. Meet telematics solution providers, telematics device manufacturers, navigation and digital map developers, smart sensors and HW manufacturers, IoT experts, M2M providers, OEMs, market research specialists, logistics and transport companies. The main topic of 4th annual Telematics Conference Middle East & Africa will be on Smart Fleets and the Future of Transportation and Mobility. You can check agenda here. Exhibit at the 4th Telematics Conference Middle East & Africa and present your latest achievements to local and international telematics industry. There is max 15 booths available and there are only 3 available left. Contact us now and book your booth. Telematics Conference Middle East & Africa speaker, Alexander Smirnov, Business Development Director Middle East at Gurtam, discusses about IoT Trends 2018 in Middle East Region. At the same time we are proud to announce Gurtam as a Diamond Sponsor of the 4th Telematics Conference Middle East & Africa. Since the very beginning of Telematics Conference Middle East and Africa, the leading industry event in the region, we have valued mutual cooperation and believed in sharing ideas among industry players. Therefore, Telematics Conference Middle east and Africa is proud to announce the establishment of advisory board with international and local experts in telematics industry, mobility and transportation. Members of advisory board are carefully selected according to their diversified but complementary expertise in the industry, with goal to help developing the industry in the future. The main function of the advisory board is to provide the event with knowledge, suggestions, network and ideas, understanding and strategic thinking of the industry. For more information about the advisory board members click here. Register now for the 4th Telematics Conference Middle East & Africa and save 20%! The offer is available only till 31 January 2018. The main topic of the 4th Telematics Conference Middle East & Africa will be on Smart Fleets: The Future of Transportation and Mobility. Agenda will be available soon. build brand awareness through MEA region. Telematics Conference team wishes you peace, joy and prosperity throughout the coming year. Register now for the 4th Telematics Conference Middle East & Africa and meet key stakeholders from global telematics industry in one place. Some of atteendes from our previous events: TomTom, MiX Telematics, Cartrack, Etisalat, Huawei, Teltonika, Tramigo, Transics, Gurtam, Inthinc, Meitrack, Queclink, Eljunga and others. Meet your business partners, get insight into latest achivements and hear from carefully selected speakers at Telematics Conference Middle East & Africa. Register now for the 4th Telematics Conference Middle East & Africa and get your pass for EUR 150/USD 170 (+10% DTCM ticket fee). The offer is available only till 15 December 2017. Are you ready for the 4th annual Telematics Conference Middle East & Africa? Download conference brochure and find out more abot the leading commercial telematics event in Middle East and Africa region. Exhibit at 4th annual Telematics Conference Middle East & Africa and present your products and solutions to global commercial telematics industry. Telematics Conference Middle East & Africa is set to take place in Dubai, UAE on 22 March 2018. The accreditation process enabling free access to the event for registered media and analysts is now open. Accreditation is compulsory. Accredited media will gain full access to all the different elements of the event, including the telematics focused exhibition, panel discussion and all networking opportunities. Telematics Conference Middle East & Africa, the telematics focused conference and exhibition offers unique place for strategic debate, knowledge-sharing, and networking for the regional telematics community. For accreditation and procedures, please contact Nevena Knezevic on nevena@telematics-conference.com. The 4th Telematics Conference Middle East & Africa will be held on 22 March 2018 in Dubai, United Arab Emirates. Meet key stakeholders, learn form carefully selected speakers and visit up to 15 exhibition booths to see latest innovations from telematics industry. Register now and get you pass for EUR 150 (plus charges and taxes, if applicable). Special prices are available till 15 December 2017! Sebastian Stefan, CEO at Load-Me.com is speaking about Telematics Conference Middle East & Africa. For more please see their blog. Telematics Conference team would like to thank to all participants of the third Telematics Conference Middle East & Africa, which was held on 8-9 March in Dubai. Special thanks goes to our speakers who shared their knowledge and their experiences with us and also to our exhibitors for presenting their products. We would like to express our enormous thanks to our sponsors, who supported Telematics Conference Middle East & Africa in Dubai. Thank you all!!! Telematics Conference will be hold on 8-9 March 2017 in Conrad hotel, Dubai. Registrations are open till 7 March. Register now! Meet Gold Sponsor Teltonika and Silver Sponsor CVS Mobile of Telematics Conference Middle East & Africa. Telematics Conference Middle East & Africa is accompanied by an exhibition with 15 booths. Meet Dynamon, Gurtam and BCE at Telematics Conference Middle East & Africa. Telematics Conference Middle East & Africa is accompanied by an exhibition with 15 booths, which are situated in front of the conference room in the registration, lunch and coffee break area. This telematics focused exhibition is a great opportunity for those companies who wish to present their products or services to telematics industry. Meet Navixy, iTriangle, Mechatronics at Telematics Conference Middle East & Africa. Telematics Conference Middle East & Africa is set to take place in Dubai, UAE on 8–9 March 2017. The accreditation process enabling free access to the event for registered media and analysts is now open. Accreditation is compulsory. Accredited media will gain full access to all the different elements of the event, including the leading telematics focused exhibition in the Middle East and Africa region, panel discussions and all networking opportunities on 8 and 9 March. Telematics Conference Middle East & Africa, the leading telematics focused conference and exhibition in the region offers unique place for strategic debate, knowledge-sharing, and networking for the regional telematics community. For accreditation and procedures, please contact Alenka Bezjak Mlakar on alenka@telematics-conference.com. There are special conference fees available for transport and logistics companies participation at Telematics Conference Middle East & Africa. Reserve your spot for EUR 200/USD 230 only. For more information click here. Get your exhibition booth at early bird price! Exhibit at 3rd Telematics Conference Middle East & Africa and increase your visibility among the telematics professionals! A special early bird price is available until 31 December 2016. For more information click here. Registrations for Telematics Conference Middle East & Africa are now open! Early bird registrations are available until 31 January 2017 for EUR 740/ USD 850 (plus VAT, if applicable). From 1 February 2017 the registration fee will be EUR 990€/ USD 1230. Reserve your spot at the event here. Find out more about the 3rd Telematics Conference Middle East & Africa which will be celebrated on 8-9 March 2017 in Dubai. Download conference brochure here. Telematics Conference team would like to thank to all participants of the second Telematics Conference Middle East & Africa, which was held on 2-3 March in Dubai. We would like to express our enormous thanks to all sponsors, who supported Telematics Conference Middle East & Africa in Dubai. Thank you all!!! On 2 March fleet managers will share their insights on the telematics industry and present their experiences, needs, and obstacles in deploying telematics solutions. For more please see agenda. In introductory discussion Telematics Value Chain: Challenges and Opportunities for the Industry, different stakeholders involved in the telematics value chain will present a global market overview and share their views on current trends in the telematics industry. SquareGPS sort out the most significant GPS and telematics events in 2016. One of them is also Telematics Conference Middle East & Africa, which will be held on 2-3 March in Dubai. For more please click here. As a part of Telematics Conference Middle East & Africa Telematics Startup event will be held on 3 March 2016 in Conrad hotel, Dubai. The aim is to expose new products/solutions in telematics for fleet and vehicle management, hear about investing trends and providing networking opportunities for investment and partnerships. Pre-selected startups will present 5-minute pitches in the attempt to convince the panel and audience that their products/solutions are highly needed in the industry. For more information on the Telematics Startup event please see Telematics Startup website or contact Alenka Zavašnik at azavasnik@telematics-conference.com . Download conference brochure and find out about 2nd Telematics Conference Middle East & Africa, which will be held on 2-3 March in Dubai. Early bird registrations for Telematics Conference Middle East & Africa are open just till 31 January. Register now and get your conference fee for only EUR 740 (plus VAT, if applicable). Regular conference fee will be availble for EUR 990 (plus VAT, if applicable) and open till 28 February. Dubai, 19 January 2016 – Telematics Conference Middle East & Africa is set to take place in Dubai, UAE on 2–3 March 2016. The accreditation process enabling free access to the event for registered media and analysts is now open. Accreditation is compulsory. Accredited media will gain full access to all the different elements of the event, including the leading telematics focused exhibition in the Middle East and Africa region, panel discussions and a concluding part of event Telematics Startup (on 3 March 2016 at 16:00), and will be able to take part in all networking opportunities on 2 and 3 March. On 2 and 3 March 2016 there will be 2nd annual Telematics Conference Middle East & Africa hold. It will be accompanied with 15 booths, which will be situated in front of the conference room in the registration, lunch and coffee break area. This telematics focused exhibition is a great opportunity for those companies who wish to present their products or services to telematics industry. The second Telematics Conference Middle East & Africa will be held on 2-3 March 2016 in Dubai. Main topic of the conference will be on Supporting business decisions with commercial fleets telematics. As telematics is fast growing industry, this topic is definitely very suitable for all companies, which deal with telematics. It will bring together all key stakeholders, experts and R&D companies in the field, transport and logistics companies and some young, prespective StartUp companies. Telematics Conference team would like to thank to all participants od the first Telematics Conference Middle East & Africa, which was hold on 12 March in Dubai. Special thanks goes to our speakers who shared their knowledge and their experiences with us and also to our exhibitors for presenting their products. We would like to express our enormous thanks to all sponsors, who supported our first Telematics Conference Middle East & Africa in Dubai. Thank you all!!! Telematics Conference Middle East & Africa in Dubai ended successfully! First Telematics Conference Middle East & Africa which was held on 12 March in Dubai ended very successfully. For the first time telematics solution providers from all over the world gathered together at this telematics focused conference. After program with speakers from very successful companies, conference concluded with panel discussion, where guests discussed about telematics in Middle East and Africa – where are we now and where are we going? To enrich even more the conference, guests also had a possiblity to network and discuss at the after conference dinner, which ended in very pleasant mood. At the first Telematics Conference Middle East & Africa carefully selected young perspective companies will pitch their idea to the telematics audience. Conference organizers decided to include in the conference agenda also three startups, and thus connect already successful companies in the telematics industry with new establish companies, which deliver innovative ideas and new approaches to the telematics sector. Startups, solving problems with connected vehicles, logistics and distribution, and big data in the transport industry, will have only 5 minutes to convince the audience that their product or service is very interesting and highly needed in the telematics industry. At the conference, the introductory market overview will be presented by Dominique Bonte, vice president and practice director at ABI Research. Bonte will speak about different growth drivers for telematics and fleet management in the Middle East and Africa. The last part of conference agenda will be dedicated to panel discussion, which will be moderated by Sebastjan Vagaja, head of business development at CVS Mobile. Panel discussion will answer many key questions on the current state of telematics in the region. What are the most important obstacles in the region? How sharp is the competition? How sector development will look like in the next 5 years? Which market segments are crucial for further development of the field? Just few days left to register at Telematics Conference Middle East & Africa! Only few days left to the Telematics Conference Middle East & Africa! Join us and become part of the only telematics focused event in Middle East and Africa region. Learn, share and network at the Telematics Conference Middle East & Africa! Teltonika will share ideas of how fleet management service providers may benefit from implementing newest 3G/LTE technologies and video monitoring solutions. Teltonika is one of leading manufacturers of devices used in fleet management applications in the World. Selling over 500.000 units per year it is well known brand name among fleet management service providers. Still not so many know that Teltonika are expects in routing and video monitoring solutions too, exporting thousands of 3G and LTE routers around the World. Teltonika is ready to share ideas about how service providers could increase value of services or even create new business cases using fleet management devices, mobile routers and video recorders. At Telematics Conference Middle East & Africa in Dubai company Omnicomm will speak about fuel consumption monitoring as a boosting factor for telematics business. Boris Pankov, Omnicomm’s CEO and founder, will disclose how precise fuel consumption monitoring can add real value to transport telematics solutions. He will show how simple the integration process is for fleet management system providers. Case studies and ROI results will describe profitability for solution, service providers and end clients. The first conference section will deliver you the answers to the following burning issues: How can integrated solutions help to increase the value added in telematics in the region? How can telematics solution providers gain benefits from selecting the right business partner and service for their business? Ethem Eldem, Senior Director/M2M Services at Etisalat will speak about the importance of smart mobility solutions in smart cities. Company Etisalat is the UAE's leading telecommunications operator and one of the largest corporations in the GCC. Sergio Barata, General Manager EMEA at Telogis will emphasize the power of connectivity and vehicles as hubs for all applications. Company Telogis provides a SaaS based location intelligence platform for companies that require telematics, dynamic routing, real-time work order management, commercial navigation and mobile applications for their workforces in the field. The first Telematics Conference Middle East & Africa, 12 March 2015, Dubai is inviting startups to apply for the “fast pitch segment”. The conference is business (B2B) focused event in the area of telematics, fleet management, vehicle tracking, fuel and route optimization. Within the program the conference offers 2-6 startups from the Middle East and Africa region an opportunity to pitch their products/solutions. Focus is on startups looking for investments/strategic partnership in the areas of telematics and IT solutions for transport/logistics/telecom, maps development, route optimization. Though this is not an investment conference, chosen start-ups will be exposed to globally known and eminent companies in the field of telematics for fleet management, who often expand through M&A and partnerships. For more information please contact Alenka Zavasnik: azavasnik@telematics-conference.com. Early bird registrations for Telematics Conference Middle East & Africa are open till 31 January 2015! Register now and meet key stakeholders, experts and R&D companies in the telematics field. Learn, share and network at the Telematics Conference Middle East & Africa! Join us at the only telematics focused conference and exhibition in the region. Register now and save! Early bird registrations are open only until 31 Januar 2015. According to a new research report from the analyst firm Berg Insight, the number of active fleet management systems deployed in commercial vehicle fleets in North America was 4.0 million in Q4-2013. Growing at a compound annual growth rate (CAGR) of 15.3 percent, this number is expected to reach 8.1 million by 2018. In Latin America, the number of active fleet management systems is expected to increase from 1.9 million in Q4-2013, growing at a CAGR of 16.1 percent to reach 3.9 million in 2018. The top ten providers of fleet management systems in the Americas now have a combined installed base of more than 2.5 million active units in the region. Leading solution providers including Fleetmatics, Trimble, Zonar Systems and Telogis now all have more than 300,000 active units in this market. The main topic of the first Telematics Conference Middle East & Africa will be Telematics as value added service in fleet management. Within three different sections (Integrated solutions, Connected region and Smart fleets) our carefully selected speakers will equip you with the answers to the following questions: How can integrated solutions help to increase the value added in telematics in the region? How can telematics solution providers gain benefits from selecting the right business partner and service for their business? What do you need to know when doing business in this region? How telematics industry should adapt to local environments? What are the main needs of the industry in the MEA region? Where the added value really appears in telematics? How can telematics solution providers implement additional smart equipment to their products and services and deliver the best value added to their clients? Why are advanced telematics solutions the future of telematics for fleet management? Warmest wishes for a happy, healthy and prosperous new year. The conference fee for Telematics Conference Middle East & Africa is EUR 800 (plus VAT, if applicable), but there are also early bird registration available till 31 January 2015, where the price is only EUR 640 (plus VAT, if applicable). Telematics conference Middle East & Africa will be held on 12 March 2015 in Dubai, United Arab Emirates. It will bring together telematics experts from different sectors who will be discussing about The importance of telematics. If you want to become an important player in the fast growing Middle east and Africa region, this Telematics Conference is the right place for you to see and build the further development of the field. Paving the way in Middle East & Africa telematics! For the first time, more than 150 key stakeholders from Middle East, Africa and countries from all over the world will gather at Telematics conference Middle East & Africa. It will be held on 12 March 2015 in Dubai, United Arab Emirates and bring together telematics experts from different sectors who will be discussing about The importance of telematics.